A lady got the fright of her life but thanks to her bravery and quick thinking, she was able to foil a hold-up attempt. She posted her terrifying experience to warn others of the new strategy that hold-uppers employ and for netizens to be aware of the criminality lurking around us. In a post shared by Pilipino Star Ngayon on Facebook, a lady narrated how she narrowly escaped from being held-up or worse, being hurt by these criminals. 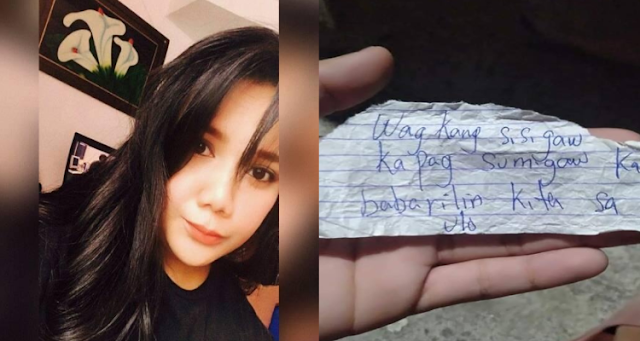 She was walking home in Molino,Bacoor, Cavite at around 8 pm after a hard day’s work when a stranger suddenly gave her a note. The man said that the note was given by someone and pointed to their back but the lady saw no one. Since the guy was a total stranger, she didn’t accept the note but the guy was insistent and told her to read the message on the note. Feeling a bit scared on the behavior of the guy, the lady kept walking, with the guy walking behind her. The lady started to get nervous when she noticed that the man was holding something but it was hidden in the side of his pants. When the guy asked her if she already read the note, she made an alibi that it was too dark, and she has poor vision. When they passed a street light, it was only then that she was able to read the note. What is written there would make her knees weak, and caused her to be a nervous wreck. Despite her nervousness, the brave lady decided to just keep walking and pretended to be calm despite the threat she is in. Fortunately, there was a gasoline station ahead, so when they passed by the gas station, she cried for help and was fortunate to have the 2 gasoline attendants respond to her cry for help. She was lucky to have escaped from the criminal who’s planning to victimize her. She decided to share her experience for the netizens to be warned and be alert, and especially those living in Bacoor, Cavite to be vigilant and avoid walking the streets at night, since we don’t know when the “hold-upper with a note” will strike again. Isang babae, nakaligtas sa tiyak na kapahamakan matapos na hindi pansinin ang liham na ibinigay sa kanya ng suspect. "Molino Bacoor Cavite (Maryhomes to San Miguel) beware and be safe!!! This is my first time receiving this kind of threat in my entire life. 7:40pm i was walking home from work when suddenly a guy gave me this letter saying na pinabibigay lang daw sakin at hindi galing sa kanya may tinuturo sya sa likod nmin pero wala namang tao. He's a total stranger for me kaya at first diko pinansin at tuloy tuloy lang ako sa paglalakad but he insisted and kinalabit nya na ako para iabot yang papel na yan. He said na basahin ko but i keep on walking para makalayo sa kanya coz he's a bit creepy for me, he asked kung nabasa kona ba i answered him na hindi pa dahil madalim at malabo ang mata ko he keeps on following me and sa right side ng pantalon nya may hawak syang something which is di ko makita ng maayos kung ano.